You may have noticed, if you follow me on Instagram, that I've been into metal stamping. This one was for my sister-in-law. It's the initials of my brother and their son. This is mine. Love & our wedding date. This one was for a sweet mama of two boys. The purple says love and the two shades of blue are her boys' initials. This one was for my mom - all the grandkids' initials - one color for each family. I found some very reasonably priced blanks to make these and decided to add these to my shop. I thought the colors were super fun. I'm a believer that handmade doesn't have to cost you a lot. I'm not doing this for a living, just a hobby, so I can pass these on to you at a small price. I think you'll notice that about most everything in my Etsy shop. 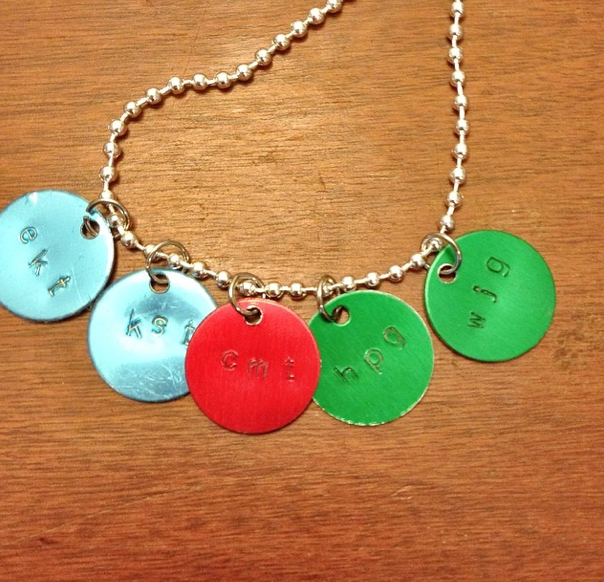 A basic necklace, personally stamped, is $5 + shipping ($8 total). Each additional disk is just $3. Contact me with any questions or if you're interested in a custom order.